As a part of some latest R&D, I wanted to replicate some data from SQL Server to MySQL. Since there is no native way to do this, I am preparing my own framework which suits my requirement. To work on the project, I have purchased, recently, cloud space with one of the hosting company where I was having CentOS 7 in the VM I have received. 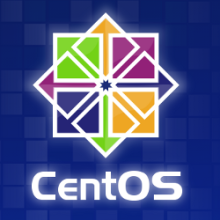 CentOS 7 is coming with MariaDB by default in its repository. I needed MySQL not MariaDB for my project so without further discussing about which RDBMS is good between these two, let us see how to install MySQL Server in CentOS 7. Before doing anything, login to your CentOS 7 server administrative/root privilege. 1.) Check the YUM repository whether you already have MySQL in your CentOS 7 or not. By default it won’t be there for sure. 2.) Download the desired MySQL Server in your CentOS 7. You can decide the desired MySQL server version from the official repository list given here. 4.) Now you are all set to install MySQL Server in your CentOS 7 by executing following command. 5.) Now try login to MySQL server we have just installed. Once you will hit “enter” button, you will be prompted with password. If you have not setup MySQL password, hit enter again or/else enter the password and hit enter. This entry was posted in MySQL, OpenSource and tagged MariaDB, MySQL, OpenSource on August 12, 2017 by Riteshshah. I have started working with Microsoft SQL Server 7.0 in late 1999 and even today I become very excited with the new version of Microsoft SQL Server. SQL Server 2016 has been in market for quite some time but now finally Microsoft has released service pack 1 for SQL Server 2016 to download. This is one of the big release after SQL Server 2012 so I am happy to welcome SQL Server 2016 in market officially as now I can start using SQL Server 2016 in my production system and can upgrade my old SQL Server box to new and latest RDBMS. I am happy that Microsoft has given many enterprise level feature into standard edition of SQL Server 2016 at the same time I am little disappointed as well because I am seeing no sign of horizontal scale out feature in this big release which is becoming mandatory in today’s data world. Let us not talk negative today as I, really, want to adopt this new system into my production as soon as possible especially the powerful standard edition (I can save big money of my company by using standard edition). Here is the official product page of Microsoft SQL Server 2016. I have already downloaded my free copy of SQL Server 2016 Developer Edition. I could not resist to mention some of my favorite features, mostly enterprise level , which are available in SQL Server 2016 Standard Edition. Dynamic Data Masking: Data security is becoming very critical nowadays especially if you are dealing with sensitive data/information like SSN number, Credit Card number. By having dynamic data masking, you can store full SSN/CC number in database but user can see only those digits, (may last few digits) which you want whereas if user has UNMASK permission, they can see complete SSN/CC number. Row level Security: Row level security is very important especially (not limited to) for the SAAS product. I might have billing/payroll information of many different vendors in my billing/payroll table but Vendor1 shouldn’t be able to see the data of Vendor2. Database Snapshot: As per MSDN, A database snapshot is a read-only, static view of a SQL Server database (the source database). The database snapshot is transactionally consistent with the source database as of the moment of the snapshot’s creation. A database snapshot always resides on the same server instance as its source database. As the source database is updated, the database snapshot is updated. Therefore, the longer a database snapshot exists, the more likely it is to use up its available disk space. I am still trying to understand where I can use this feature in some of the production system I manage as it has a list of pro/cons and needs to decide whether the pro list is big or the cons. Columnstore: First I have learnt about Column store index in SQL Server 2008 R2 during some BI project. Columnstore index is available in database engine (from SQL Server 2012) but still I think it is more usable for analytical queries, maybe I am very much used to with row-store traditional index, especially non-clustered covering index. Compression: SQL Server 2016 supports GZip algorithm for COMPRESS/DECOMPRESS data during DML operations. Finally, I could save some more valuable SSD disk space in my server. In-Memory OLTP: In-Memory OLTP is a memory-optimized database engine integrated into the SQL Server engine, optimized for transaction processing. In-Memory OLTP could surely increase performance of application by improving throughput and by reducing latency for transaction processing. Always Encrypted: As per MSDN, Always Encrypted is a feature designed to protect sensitive data, such as credit card numbers or national identification numbers (e.g. U.S. social security numbers), stored in Azure SQL Database or SQL Server databases. Always Encrypted allows clients to encrypt sensitive data inside client applications and never reveal the encryption keys to the Database Engine (SQL Database or SQL Server). As a result, Always Encrypted provides a separation between those who own the data (and can view it) and those who manage the data (but should have no access). By ensuring on-premises database administrators, cloud database operators, or other high-privileged, but unauthorized users, cannot access the encrypted data, Always Encrypted enables customers to confidently store sensitive data outside of their direct control. This allows organizations to encrypt data at rest and in use for storage in Azure, to enable delegation of on-premises database administration to third parties, or to reduce security clearance requirements for their own DBA staff. Polybase: And lasts but not the least in my favorite list, PolyBase is a query engine designed to fill the gap between the relational database of SQL Server with the big unstructured data mostly stored in Hadoop which can be used for analytics. We could even use Polybase with Azure Blob storage. This entry was posted in Service Pack, sql server, SQL Server 2016 and tagged MS SQL Server, SQL Server 2016 on November 19, 2016 by Riteshshah. SQL Server 2014 is recently announced in TechED Europe. I am really very excited to download and knew more about it. You can download SQL Server 2014 CTP 1 from here. Each new version of software needs compatible hardware and software. Those are mandatory before you try your hands on new version. You can find Hardware & Software requirement from here. SQL Server 2014 comes up with enhancement in piece of SQL Server like database engine, analysis service, integration service, reporting service and replication. Have a look at this in more details from this link. When we talk about Microsoft product then how can we forget wonderful MSDN, have a look at MSDN here. It is interesting to discuss…!!!! 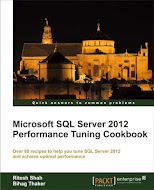 This entry was posted in SQL Server 2014 and tagged SQL Server 2014 on June 28, 2013 by Riteshshah. I have very often seen that people are so used to with traditional methods and hence never think in terms of set based programming, they used to write code with evergreen traditional method which people used to use in sequential language like C or many be ASP etc. Let us see this practically with an example. Create one sample table with row given in following TSQL Script. Now we have situation that if we pass “ALL” from application, it should show data from all department otherwise it should show data from the specific department which is provided in the variable. Let us see method one where people used to use IF condition to check value and have two separate SELECT statement. I don’t prefer this one, why we should write two SELECT statement whereas we can write only single. If we have many conditions, we have to repeat SELECT query in this method which is not preferable from the maintenance point of view. There are some people who uses method 2 where they take value in temporary table to find filter value and pass it to main SELECT clause so in this method you will have only one main SELECT clause but this is also less preferable method as it has multiple SELECT statement in set along with temporary table which affect performance adversary in most cases so don’t use temporary table unless there is no way around. Are you using any other method to achieve the task explained here? It is interesting to discuss…!!!! Reference: Ritesh Shah http://Extreme-Advice.com http://www.sqlhub.com Note: Microsoft Books online is a default reference of all articles. This entry was posted in CASE WHEN THEN, sql server, TSQL and tagged CASE WHEN THEN, TSQL on May 28, 2013 by Riteshshah. Few weeks back, I have written one article “Find Service Broker Queue Count in SQL Server”. One of the blog reader has created the UDF I have given in that article and tried to fetch value of that UDF from his web application to find the service broker queue count but, unfortunately, It was returning 0 value in web application but if he tries to execute UDF function in SSMS itself, it used to return proper queue count. He wrote me back to find the solution of the problem he was facing. I asked him the login he is using in SSMS as well as from application and as soon as I get this answer from him, I get to know the reason exact issue he was facing. He was using Windows Authentication “Administrator” login while using SSMS and was using WebAppEnt SQL Server login from web application. I guessed that Administrator login would by sysAdmin and WebAppEnt login would have only required permission which my reader confirmed. I told him to give proper permission to WebAppEnt login with following script. This entry was posted in sql server and tagged GRANT, View Any Definition on April 11, 2013 by Riteshshah. Since we have big service broker setup, it is very important to know for us about thread running for target queue. Target queue is the queue which suppose to do the work of actual business logic and we used to give proper naming convention to each queue. Suppose we have one billing queue then we suppose to name it as “BillingInitiatorQueue”, “BillingTargetQueue” etc. Since target queue has responsibility to implement actual business logic, I am always interested to see how many thread currently running for each target queue. Suppose I have set 15 thread for “BillingTargetQueue” but it may happen that I have only 5 to 10 messages in queue and hence all 15 thread will not be active. If I don’t have any message in queue then obviously no thread will be active though I set 15. Sometime I may have 1000 message to process in target queue but even I have 10 thread active only. Remaining 5 thread may not be getting proper system resources or anything else. I can’t even decide whether to increase thread or decrease without knowing actual number of message, time thread is taking to process. I have already written articles about “Find Service Broker Queue Count in SQL Server (Click Here) ” and “Keep watch on Service Broker Queue Delay in SQL Server (Click Here) ”. Today I am going to show the script which will give the count of thread for target queue running at the moment. I have written few more article about service broker, have a look if you are interested. This entry was posted in Active Thread Count, Queue Count, Service Broker, sql server and tagged Active Thread Count, Queue Count, Service Broker on April 10, 2013 by Riteshshah. Recently one of my client has faced weird situation related to SQL Server Replication. Their main database goes down so they started running mirroring database as a primary database, removed subscriber and distributor. Once they have setup primary server back properly, they have restored mirrored database backup to primary server. Now situation is complicated as subscriber was removed, distributor was removed but in primary server, they are seeing publication as well as subscriber. They have already tried the way I have explained in one of my earlier article “Forcefully remove replication publisher, subscriber and distributor in SQL Server” but no luck. When they tried to remove publication by pressing “Del” key after selecting “Publication” under “Replication” in SSMS, they faced following message. Could not delete publication 'SMXPPublisher'. Cannot drop the publication because at least one subscription exists for this publication. Drop all subscriptions to the publication before attempting to drop the publication. If the problem persists, replication metadata might be incorrect; consult Books Online for troubleshooting information. This is obvious message that they can’t delete Publisher until and unless they remove subscriber under publication but the twist is they have already deleted subscriber from the secondary server and primary server were down at that time so effect doesn’t came there so while deleting subscriber from the primary server, they were greeted with following message. "MARS:SMXPRepl" does not exist on the server anymore. Please refresh its parent tree node. Now, there is a big question, how to remove this replication? After getting in this clumsy situation, they have called me up to help. They needed very fast solution so I provided undocumented and dirty but yet workable way. Here is what I have asked them to perform and update me with the result. Here is the small TSQL script I told them to run on primary server in replicated database. --Cannot drop the table 'dbo.MSpeer_lsns' because it is being used for replication. Well, my suggestion now is to unmark “MSPeer_lsns” object from replication with following command and then try to execute above script to remove and drop replication. Again there wasn’t luck with them so finally I send them one more TSQL which did the magic. After executing above given TSQL script, it has removed everything related to replication. However, I don’t recommend this script for normal situation. Here is the list of my other replication related articles, if you are interested!!!! This entry was posted in replication, sql server and tagged Force remove replication, remove publication, remove subscriber, replication on April 9, 2013 by Riteshshah. Once you are addicted with some keyboard short keys then you hate to use mouse for those things for sure. 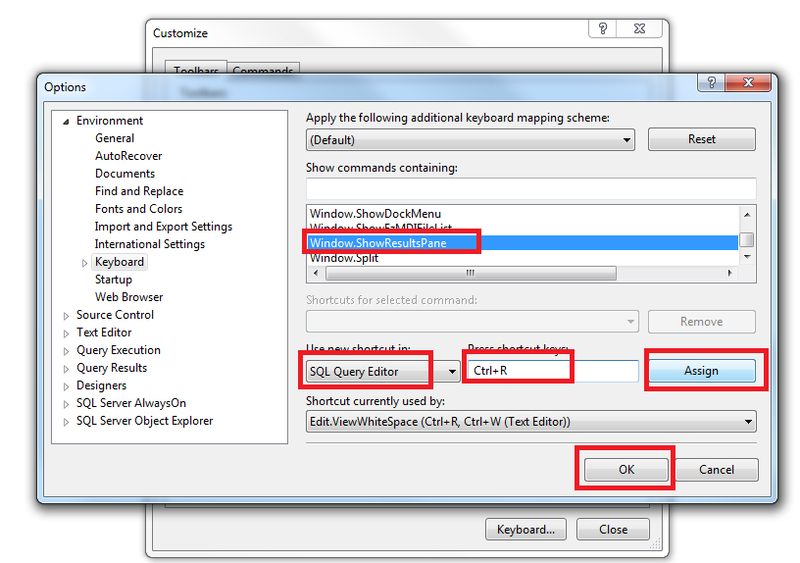 SQL Developer/DBA are, mostly, addicted with “CTRL + R” short key which is being used to show/hide result panel in SSMS. I, many time, received question/complaint that CTRL+R is not working in SQL Server 2012’s SSMS, especially from the user who are using Windnows 7 (Windows 8 doesn’t have this behavior, at least for me). Well, this is very known issue and there is a workaround for this. Let us see how shall we do this…..!!! 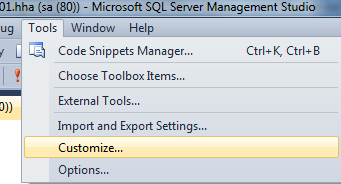 Once you open the SSMS, go to Tools | Customize. Once you will get “Customize” dialog box, click on “Keyboard” button from the “Customize” dialog box. 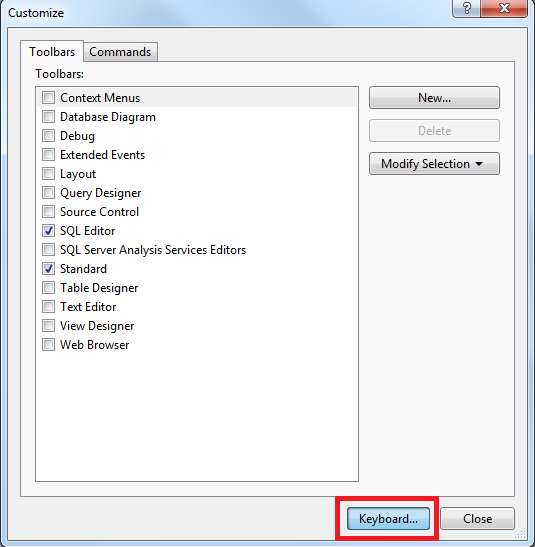 Now you will be greeted with “Options” dialog box, where you have to select “Windows.ShowResultPane” option from listbox given under “Show Commands Containing”, select “SQL Query Editor” under “Use new Shortcut in”, also Press the short key you wanted to use (I have selected very known CTRL+R) under “Press shortcut keys” and click on “Assign” button and close the dialog box by clicking on “OK” button. Now, you are there with your very own shortcut key “CTRL+R”. It will work in SSMS even in Windows 7. This entry was posted in sql server and tagged CTRL+R, Shortcut key, Show Result Pane on April 8, 2013 by Riteshshah. I, generally, don’t tend to keep disabled job in my server. I would always like to remove disabled job after generating the script and keep the backup of script and this is the reason whenever someone intentionally or unintentionally disabled the job, my monitoring application shows the server name and disable job. There is one small TSQL SELECT script which shows the disabled job along with server name and last modified date. This entry was posted in sql server and tagged Disabled Job, SQL Server Job on April 6, 2013 by Riteshshah. Though you are working as SQL Server DBA, you have to think, at least sometime, beyond relational. We can schedule different types of backup, ie: full, differential, transaction etc., from within SQL Server but what if you want to set archiving policy also? There are so many different ways to accomplish this task but I, personally, prefer to go for .BAT file which can be called from windows schedule task. Suppose I want following policy (obviously one can change the policy given below as per their need). I already have maintenance plan running in SQL Server which keeps taking full backup everyday and transaction backup at every 15 minutes. I will handle copy/archive process from .BAT file and schedule this batch file to run at everyday 12:05AM to move previous days backup and remove older backup. Sqlcmd -E -S"RiteshPC\Dev2012" -dmsdb -Q"set nocount on ; SELECT DISTINCT bmf.Physical_device_name +','+'\\192.168.1.200\RiteshPCDev2012Backup\DatabaseName\'FROM msdb.dbo.backupset (nolock) bs INNER JOIN msdb.dbo.backupmediafamily (nolock) bmf on (bs.media_set_id = bmf.media_set_id) WHERE bs.backup_finish_date > DATEADD(HOUR,-24,GETDATE()) " -o "E:\Batchfiles\BackupFileDev.txt"
forfiles.exe /p E:\Database-Backup\Dev /s /m *.bak /d -1 /c "cmd /c del @file"
forfiles.exe /p E:\Database-Backup\Dev /s /m *.trn /d -1 /c "cmd /c del @file"
forfiles.exe /p \\192.168.1.200\RiteshPCDev2012Backup\DatabaseName /s /m *.bak /d -3 /c "cmd /c del @file"
forfiles.exe /p \\192.168.1.200\RiteshPCDev2012Backup\DatabaseName /s /m *.trn /d -3 /c "cmd /c del @file"
Herewith I want to list some points where you may need change while setting up batch file for your environment. “RiteshPC\Dev2012” is my SQL Server Instance name, you have to provide yours. I have used “DATEADD(HOUR,-24,GETDATE())” in SELECT query as I want to deal with all the backup comes in last 24 hours only. “\\192.168.1.200\RiteshPCDev2012Backup\DatabaseName\” is the network path where I want to put backup for three days. Select query ran in MSDB database will output results in text file at “E:\Batchfiles\BackupFileDev.txt”. That file will be read, copy the backup to network path. In 2nd and 3rd “ForFiles.exe” I ham deleting .bak and .trn files from the networks which are older then 3 days. Do you have any other way to manage copy/archive of backup? This entry was posted in archive database, batch file, Copy database, sql server and tagged .bat, archive backup, btch file, Copy backup on April 5, 2013 by Riteshshah.